The Hamilton County Council on Alcohol and Other Drugs has added more than a half-million dollars to its pool of resources after it was awarded three grants. The collective $590,343 will primarily be used for the planning, implementation and operation of quick-response teams to fight opioid abuse countywide. The largest grant, $490,342, is from the Bureau of Justice Assistance, an arm of the U.S. Dept. of Justice. The other grants, $50,000 each, are from the Indiana Division of Mental Health and Addiction. The DMHA grants are intended for planning. The Council on Alcohol and Other Drugs has key players on board, including representatives from law enforcement and criminal justice agencies, fire departments, treatment centers, communications and 911 dispatch, data collection and agencies. Greer said approximately 45 members from the agencies are involved with the new initiative alone. Efforts stemming from the DMHA grants will begin first in Noblesville. Greer said the quick-response teams should be up and running before the end of the month or early February. The federal grant will encompass the entire county. The quick-response teams will be introduced in Noblesville, Fishers and the county’s smaller communities like Sheridan, Atlanta, Arcadia and Cicero. Carmel and Westfield already have similar programs, and Greer said her council plans to build off of those. Greer said overall, quick-response teams will allow the county to provide resources at a level it hasn’t seen before. If the individual who overdoses is arrested, treatment programs are offered through the jail or referred by the court system. Greer said her council’s teams and programs that are changing as a direct result of the grants are for those who have slipped through the cracks or were not arrested for drug crimes, which happens when there is no evidence of drugs or paraphernalia. Once the changes are in place, Greer said a quick-response team will visit homes within 48 to 72 hours after the incident to check on the individual and provide support. Quick-response team members also will canvas communities, going door to door to provide help. Each team is made up of a law enforcement official, a firefighter and a peer-recovery coach. The grants also will create a Community Opioid Prevention Effort (COPE) coalition, whose members will compile information and provide community mapping for areas with a high frequency of opioid abuse. 300: More than 300 doses of Narcan were administered by Hamilton County first responders in 2017. Numbers for 2018 are still being gathered. 36: In 2017, there were 36 opioid poisoning deaths in Hamilton County. Experts say the number is likely higher because overdose deaths are often reported as the actual cause of death. For example, someone who overdoses can die of a heart attack or stroke, making it difficult to keep data on the real number of opioid deaths. 3x: Deaths from opioid overdoses in Hamilton County rose 300 percent in 2014, 2015, 2016 and 2017 from the six years prior. From 2008 to 2013, there were less than five opioid-overdose deaths each year. In 2014, there were 18. There were 21 in 2015; 26 in 2016; and 36 in 2017. 16: By May 2018, there were 16 opioid-overdose deaths in Hamilton County. 52 percent: Hamilton County saw an increase of approximately 52 percent in non-fatal emergency department visits due to opioid overdoses from 2011 to 2015. 500: Hamilton County 911 Dispatch received 500 opioid-overdose calls, with an average of 30 calls per month, in 2017. 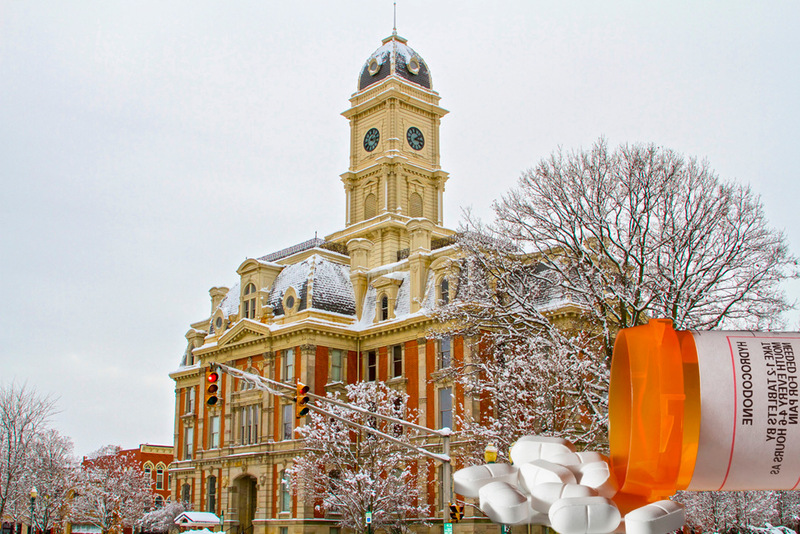 1,146: The Hamilton County Prosecutor’s Office filed 1,146 charges for controlled-substance possession and/or drug-dealing offenses in 2017. 28 percent: Of the Hamilton County Probation Dept.’s 10,771 urine drug screens in 2017, 28 percent tested positive for opiates. 95: In 2017, the Noblesville Fire Dept. administered 95 doses of Narcan. The Noblesville Police Dept. administered six doses. 72: In 2017, the Fishers Fire Dept. administered 72 doses of Narcan. The Fishers Police Dept. administered four. 61: In 2017, the Carmel Fire Dept. administered 61 doses of Narcan. The Carmel Police Dept. administered nine. 36: In 2017, the Westfield Fire Dept. administered 36 doses of Narcan. The Westfield Police Dept. administered eight.